This function is rare, but it is used, for example, with some OBD-I 2.8L 12V V6 engines. The very name of this function annoyed us, so we added a twist. You can look at two channels of "Single Readings" at once! 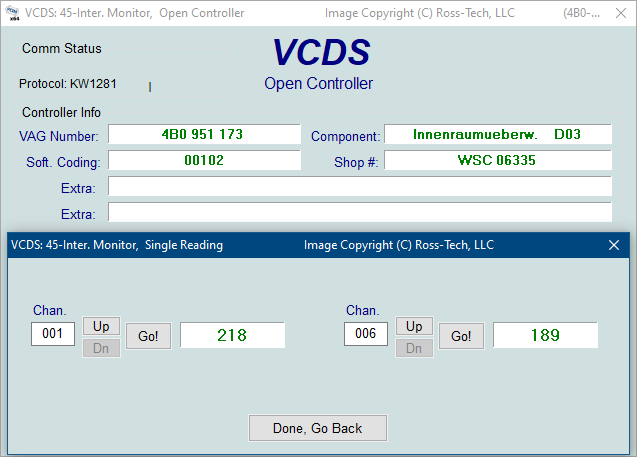 The Single Reading function allows you to look at real-time data from control modules that support it. However, the data stream coming from the control module gives NO CLUE what the data means or how to scale it into real-world values. The only way to know what the values mean is to find a reference to this function in the Factory Repair Manual for your car. Use [Up] and [Dn] to scroll through the available groups (000 - 255 on some Control Modules). Don't become discouraged when you find some where the fields are all blank.